Al-Numeira Environmental Association at the Regional Youth Football Match! Today, Thursday 7th March, 2013, a team from the Al-Numeira Environmental Association (located in South Ghour) joined a regional youth football match event between Ghour al-Mazraa and Ghour al-Safi. 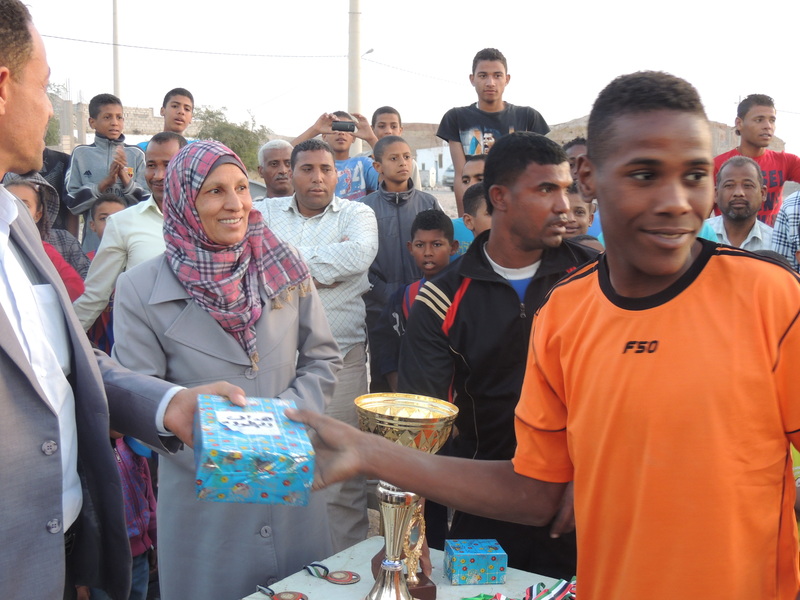 Before the match, the Association was delighted to donate a trophy and a selection of medals to the youth centre in al-Safi, where the match took place, and, following the match, these were presented to the best overall player (Hammam Khalid), the best goal scorer (Muhammad Hamid), the best goal keeper (Muhammad ‘Ali), the model player (Zayd Yasir), the best coach (Sadam al-‘Ashibat) and – of course – the winning team – Al Nawrass!!! The Al Hadithi Team also received runner-up medals. The medals were presented by Muhannad Di‘isat and Sabah Shu‘ar as NEA Representative, trustee of the NEA and a former head-teacher from Ghour al-Safi. It was a truly magical event. The match kicked off at 4pm beneath the stunning mountains which surround Ghour al-Safi – the lowest village in the world – and crowds of locals joined the Association to cheer on the players who hail from numerous different schools throughout the region. The match was action packed and the players showed off their impressive skills to an enthusiastic audience. The final result was 4-1 to Al Nawrass – Ghour al-Safi – congratulations to all the players!!! Having thoroughly enjoyed the event, NEA hopes that, through encouraging youth sporting events such as today’s match, we can also raise awareness about the environmental issues which we are currently working to resolve. The young players from both teams represent the future of South Ghour and we hope to channel some of their amazing positive energy, strength and enthusiasm into our many community projects – protecting the region’s natural resources, educating both locals and internationals about the dangers currently facing the area and encouraging eco-tourism in the South Ghour region. Through sharing this fantastic and truly memorable afternoon together, we have further communicated our message to yet more youngsters, encouraging them to come and work with us in the local schools, digging, planting and cultivating the land to ensure we all have a sustainable, living future! وأيضا حصل الفريق الفائز ( غور الصافي )على الكأس وكما حصل فريق غور المزرعة على ميداليات ترضية التي قدمها السيد مهند الدعيسات وأمين السر لجمعية النميرة البيئية السيدة صباح الشعار. بدأت المباراة الساعة الرابعة عصرا في أجواء رائعة وحماسية بحضور الناس المحليين مشاركين هذا الحدث أعضاء جمعية النميرة البيئية لتشجيع الفريقين ، حيث المباراة امتازت بطابع التشويق بين اللاعبين وظهور مهارات مختلفة في اللعب . وفي النهاية المباراة حصل فريق غور الصافي على أربعة أهداف مقابل هدف ومبروك للفريق الفائز ولكل اللاعبين. علما بأن من أهداف الجمعية المساهمة في تنمية المجتمع المحلي من خلال حفزهم وتشجيعهم في جميع الأنشطة والحفاظ على البيئة وهو الهدف الأسمى للجمعية وكذلك من خلال أستثمار الطاقات الشبابية في الحفاظ على البيئة لأنهم مستقبل الأغوار الجنوبية وتشجيع هذه الطاقات على الحفاظ على المصادر الطبيعية الموجودة في المنطقة وتوعية الناس المحليين وكذلك الأجانب بالمخاطر التي تواجهها هذه المصادر الطبيعية والحد منها. وكما تهتم الجمعية بالسياحة البيئية الداخلية في المنطقة . من هنا ندعو الشباب للانضمام والمشاركة في فعاليات الجمعية والعمل في المدارس يدا بيد لمستقبل أخضر.